The Chechen rebel leader finally takes responsibility for last months' blast. Chechen rebel leader Doku Umarov claimed responsibility for the Domodedovo Airport bombing, but new reports from investigators cast doubt on his declaration, as an independent terrorist cell was said to be behind the attack. Meanwhile, sackings at the government continued, and a leak linked the attackers to cars of a Scandinavian embassy. Umarov's video appeal appeared on the insurgents' online mouthpiece Kavkazcenter.com, which said it received it by e-mail late Monday.The video was removed from the web site Tuesday, but it is available on YouTube. 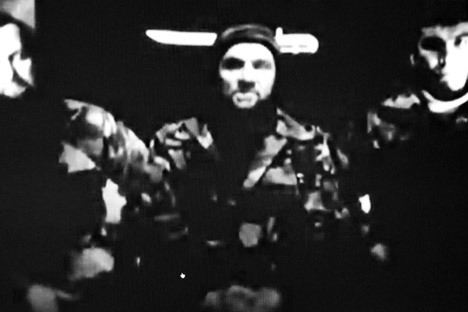 The 14-minute video shows Umarov wearing a military uniform while sitting beside a blank wall. The rebel warlord called the Domodedovo bombing, which killed 36 people last month, a "special operation carried out on my order." He said he did "not want to shed so much blood," but wanted Russia to "come to its senses" and "leave the North Caucasus," which it had "invaded and oppressed," depriving the locals of their civil rights, including freedom of religion. He added that he doubted "freedom can be achieved without war," and called on Muslims to fight against "Allah's enemies." Federal Security Service spokesman Nikolai Sintsov told Interfax on Tuesday that the service “deems it inappropriate to comment on declarations by bandits and terrorists." But an unidentified law enforcement source told the agency earlier that investigators of the Domodedovo bombing were examining all information related to the blast. Investigative Committee chief Alexander Bastrykin told the State Duma at a meeting behind closed doors Tuesday that the Domodedovo attack had been "solved," senior lawmaker Gennady Gudkov said, Interfax reported. The Domodedovo attack was masterminded by an independent terrorist cell numbering no more than seven people, Gudkov said, Rosbalt reported. The group is "autonomous in planning its actions but probably has ideological links" to other groups, the lawmaker said. He did not identify the members, but said that "they are both the masterminds and the organizers" of the attack. Earlier media reports identified the suicide bomber who carried out the blast last month as Magomed Yevloyev, 20, an Ingushetia native, a claim confirmed by an anonymous Duma source after the Tuesday meeting. Gudkov's statement contradicted Umarov's claim that he had directly ordered the Domodedovo attack, as Umarov claims to be the informal leader of all North Caucasus insurgents, controlling at least dozens of rebels. Still, the lawmaker said he did not rule out a link between Umarov and the perpetrators of the blast. Meanwhile, tabloid Lifenews.ru reported that law enforcement agencies were looking for two cars with license plates of the Danish embassy in connection with the Domodedovo attack. The cars are a silvery Volkswagen Golf and a khaki Volvo XC70 with red license plates, allegedly driven by two North Caucasus natives, a man named Aslan, with a scar on his left cheek, and an unidentified woman, the report said. An embassy spokesman confirmed to The Moscow Times on a customary condition of anonymity Tuesday that both cars were "in the embassy's possession," but said there were "no signs of them being stolen." He also said embassy officials had contacted police over the report, but were told the cars are on their wanted list. The spokesman refused to say where the cars were or whom they belonged to, citing security reasons. Red license plates used on diplomatic cars give de-facto immunity from traffic police, who are not allowed to stop or search such vehicles. The FSB faced a mild shakeup over the bombing, but details remain largely kept under wraps. The agency reported on its web site Tuesday that two senior officials were fired and more faced disciplinary sanctions, but only named some of them. The agency's chief, Alexander Bortnikov, also presented President Dmitry Medvedev with a list of state officials who should be held accountable for allowing the attack, Kremlin spokeswoman Natalya Timakova told Interfax. But she did not identify any candidates for dismissal. Four senior policemen lost their jobs after the blast, but an Interior Ministry source told Interfax on Tuesday no more firings at the ministry will follow. The head of the Federal Transportation Inspection Service, Gennady Kurzenkov, became the latest high-profile victim of blast-related sackings, as he lost his job Tuesday, the government's web site reported. Transportation Minister Igor Levitin had earlier recommended he be fired over the attack. Sixty-two of the 180 people injured in the blast remained hospitalized Tuesday, Interfax said. Two of them are in a serious condition. Police and investigators in the republic of Bashkortostan have detained two suspected members of a North Caucasus terrorist group, confiscating components for homemade bombs and extremist literature from their apartments, regional investigators said in a statement Tuesday. Meanwhile, in Chechnya, a search for a group of terrorists was started Tuesday, the republic's President Ramzan Kadyrov said, Interfax reported.